Remember the series of prints posted below, called Almanack? I started them three years ago, shortly after a month-long residency at American Antiquarian Society, where I studied 18th- and 19th-century printed images. The three prints I've completed so far haven't been very well received (translation: many rejection letters plus lack of enthusiasm from family members) but I still like them, dammit. So I'm starting another. One of the things that really stood out during my research at American Antiquarian Society was, well, the whiteness of it all. Colonial history was documented and told by the colonists, and they were pretty darn Euro-white up here in new England. 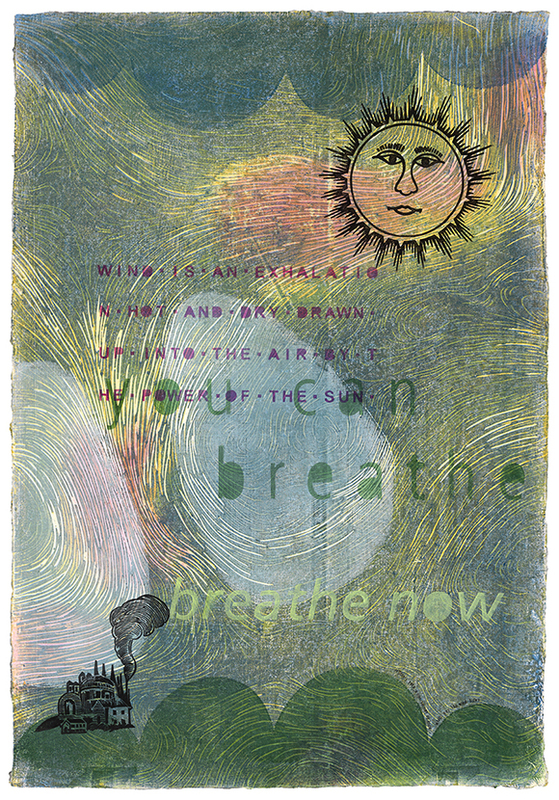 When I started these prints I began by reproducing colonial images and putting them together with invented environments and text from 18th century "science" books and almanacs. I didn't entirely know what they were about when I started them, but when I look at them now they sure look to me like a depiction of white status anxiety. Here's a recap of the three Almanack prints from 2015-16. Wind is an Exhalation hot and dry, drawn up into the Air by the Power of the Sun, and by the weight thereof driven down. This is an example of the science of America's founders, based on Aristotle's natural philosophy and the Aristotelian concept of "exhalations," which are ill-defined but seem to be a way of describing the invisible flow of things such as wind and water. The 2014 death of Eric Garner and his awful last words "I can't breathe" were very much part of the air in 2015. An earthquake is caused by means of wind that be enclosed within the caves of the earth and can find no passage to break forth. 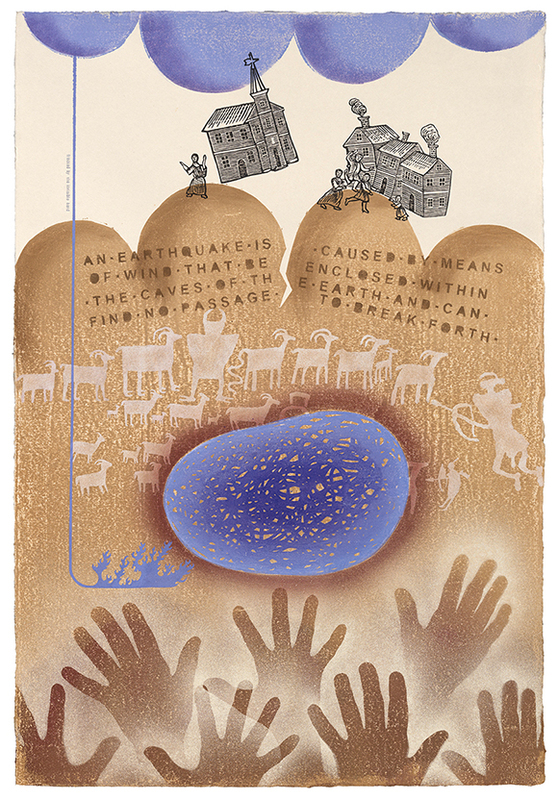 A woodcut said to be an illustration of the Boston earthquake of 1727 is combined with petroglyphs from Utah and hand prints such as are found in caves all over the world. History lives in layers under our feet, it courses through our blood, and it is present in our thoughts and conceptions of the world. Sometimes history haunts us. Sometimes history rises up seeking justice. These little Puritans can feel the quake, but seem unaware of exactly what it is that's shaking their world so. The image of the fisherman comes from a grammar book called A New Guide to the English Tongue, published in Philadelphia in 1770. This picture was used to illustrate a fable called "The Fisherman and the Fish" in which a captured fish asks to be released, promising that she will come back and allow herself to be caught when she's grown larger. The fisherman says no, and the moral of the fable is "Never let go a Certainty for an Uncertainty." 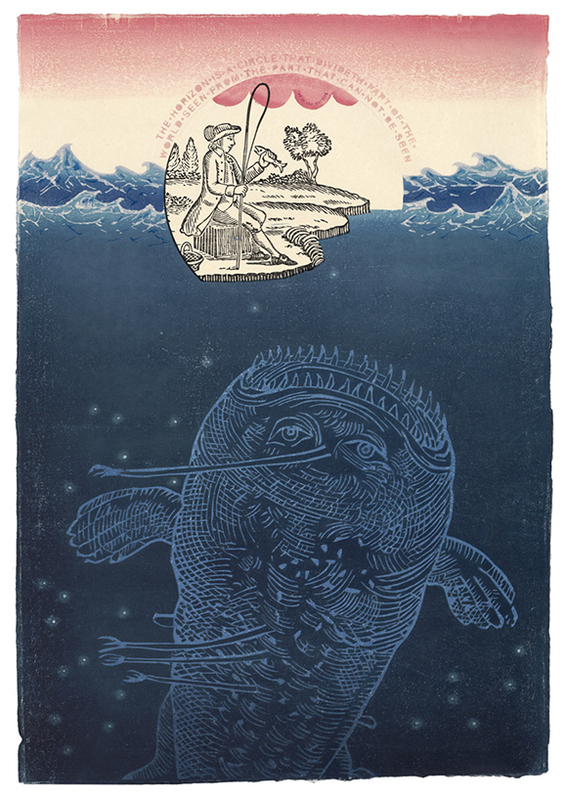 The sea monster is a European image, from the mid-1600s. We tend to believe that every generation expands its horizon line of knowing a little more, when in fact the unknown remains always on the horizon. Hopefully, as Rilke said, "everything that frightens us is, in its deepest essence, something helpless that wants our love." Or at least it wants our attention.